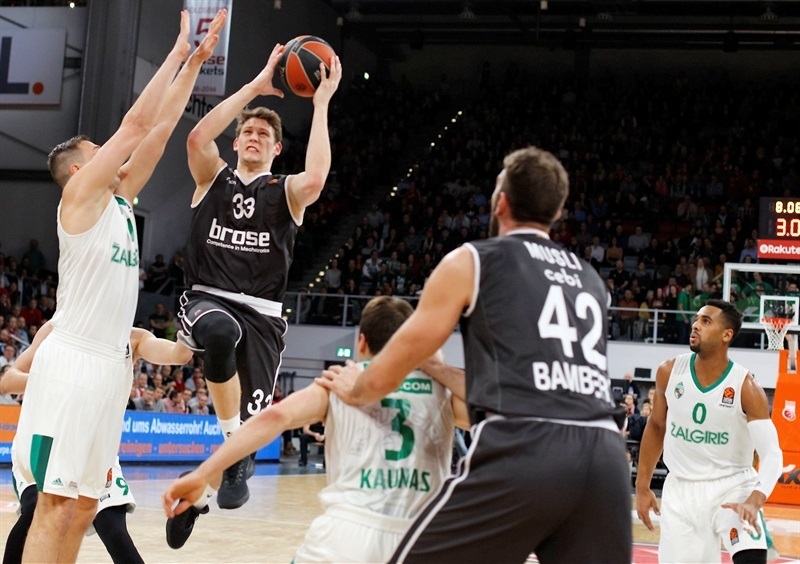 Brose Bamberg snapped a five-game losing streak with a 93-86 victory over Zalgiris Kaunas in a ferociously intense battle at Brose Arena. 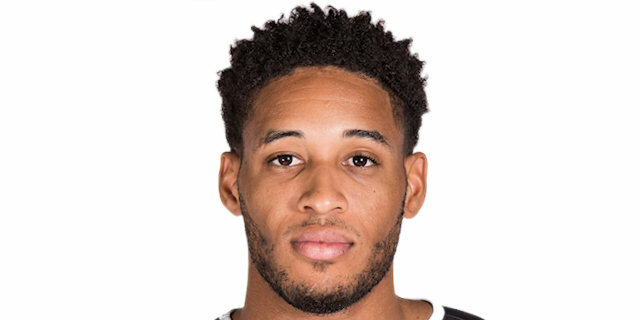 It was close throughout, with neither team leading by more than 7 points at any stage, and the outcome was in the balance until Daniel Hackett hit a crucial long two-pointer inside the final minute. With head coach Andrea Trinchieri recovering from shoulder surgery, Brose was led by assistant coach Ilias Kantzouris and delivered a commendably determined performance to improve to 7-11, paced by 22 points and 7 rebounds from Augustine Rubit. Another big performance in the paint came from Dejan Musli with 14 points and 6 rebounds, and Hackett added 16 points. 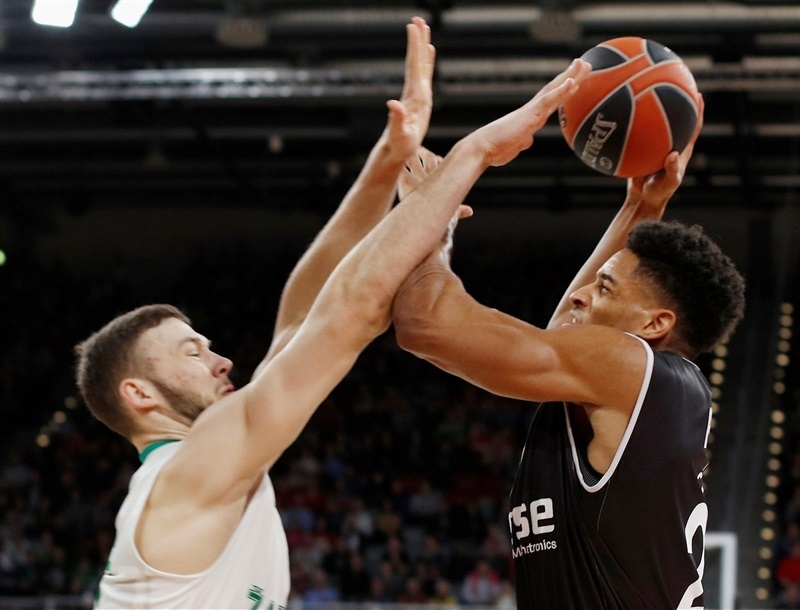 Aaron White excelled for Zalgiris, which dropped to 11-7, with 23 points and 8 rebounds, while all of Arturas Milaknis’s 18 points came from behind the arc. Vasilije Micic scored 12, Brandon Davies added 10 and Kevin Pangos had 9 points and 10 assists. 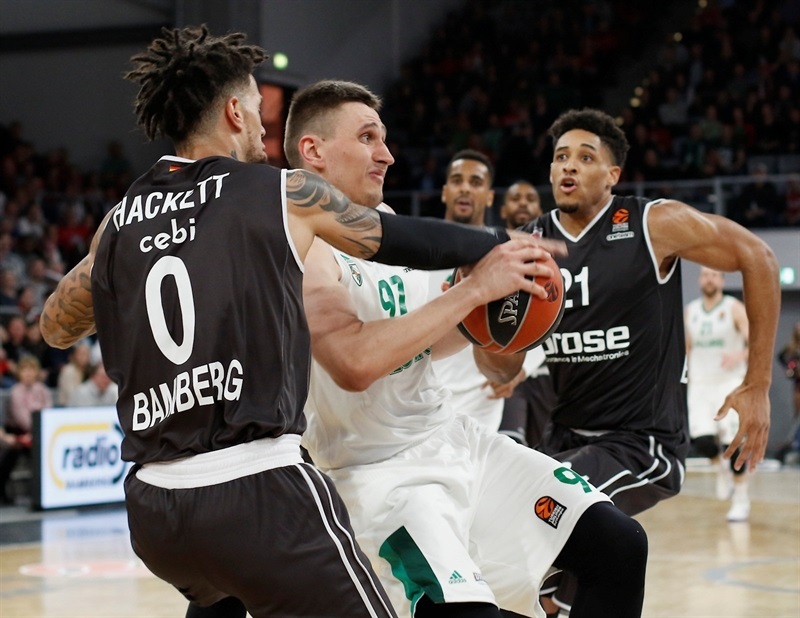 Baskets were traded evenly in the early stages, with Davies scoring twice for Zalgiris while Patrick Heckmann netted a triple and Musli scored plus a foul for the hosts. A long two from Axel Toupane and a running jumper from Pangos sent Zalgiris ahead. Rubit tied it again from close range and Musli scored twice in an 8-0 run to make it 18-12. 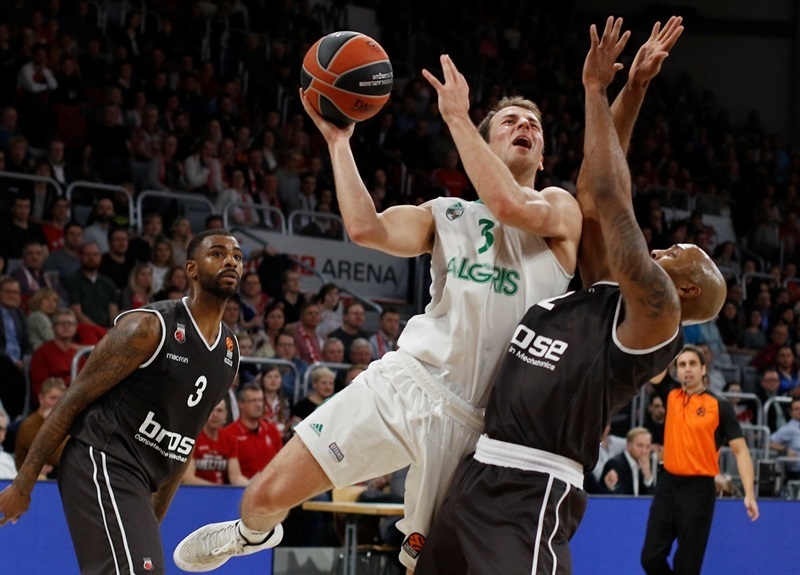 But a triple from Micic sparked a response from Zalgiris, which moved ahead as White scored 4 consecutive points. Micic beat the shot clock as Beno Udrih laid up to complete a 1-12 run, but Leon Radosevic responded for Brose to make it 21-23 after 10 minutes. The see-saw pattern continued in the second quarter, which started with a triple from Hackett, but soon saw a three-point play from Micic. 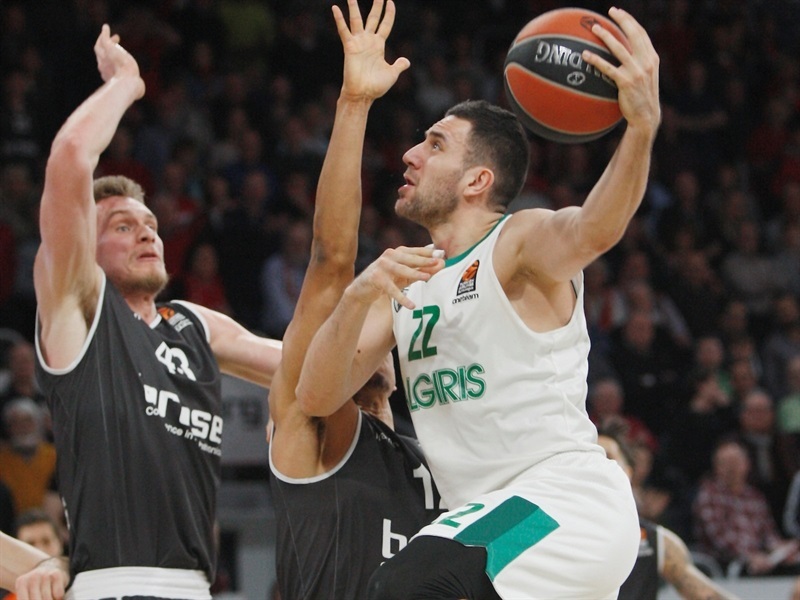 Milaknis made a trio of tough three-pointers to repeatedly edge Zalgiris ahead, while Rubit scored 5 for Brose and Musli tied it at 37-37 after grabbing an offensive board. 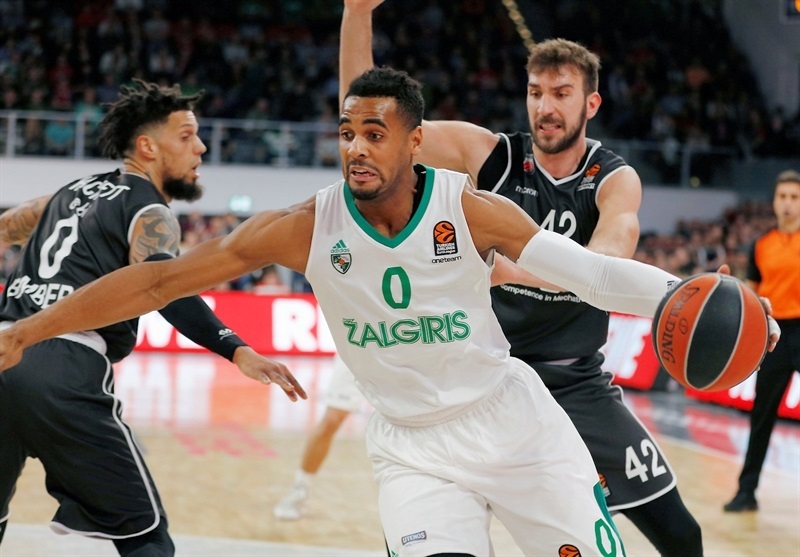 But Pangos netted a jumper, Antanas Kavaliauskas scored from underneath the basket and White recorded a layup and one as Zalgiris finished the half with a 0-7 run to lead 37-44 at the break. 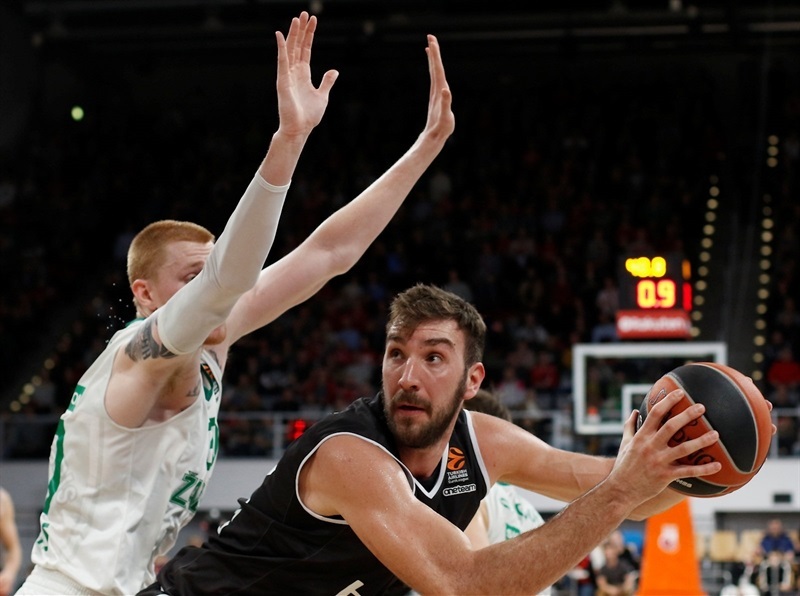 Dorell Wright opened the second half with a triple, but Milaknis answered with his fourth of the night and Davies scored to stretch the lead, before Nikos Zisis bounced in a lucky three off the rim and then hit a more conventional long-range strike. Musli scored off another offensive rebound to make it 49-51, but Milaknis made his fifth triple and White dunked to keep Zalgiris in front. Zisis made his third three-pointer of the quarter as Brose came back, and Rubit tied it from close range. Pangos joined the long-range shooting party to restore the visitors’ lead, but not for long as free throws and a Hackett jump-hook made it 62-59. Heckmann scored a reverse layup to cap an 8-0 run, but Micic answered with a mid-range jumper and it was 64-61 after three quarters. Davies opened the final period with a layup before White and Radosevic traded alley-oop dunks within seconds. Wright’s triple sent Brose 4 ahead, and Rubit made it 74-67 from the free throw line as Paulius Jankunas fouled out. Milaknis came back with yet another triple, but Maodo Lo answered with a downtown strike for Brose, and hot-hand Rubit spun to score for a 79-72 lead with four minutes left. White scored 4 straight to tighten it up, but Hackett scored free throws and a jumper to keep Brose ahead. Rubit bagged another big bucket before White dunked, and it was 85-82 with a minute to play. 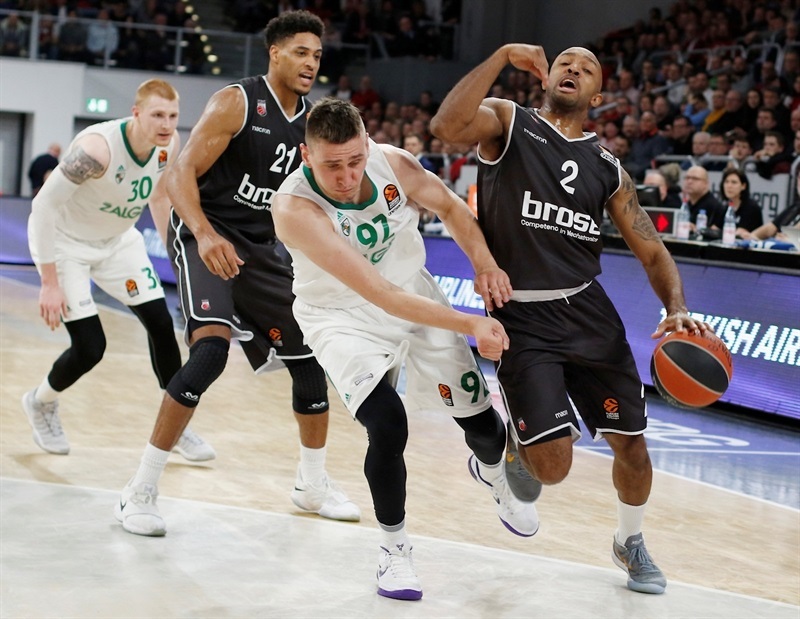 Hackett made a crucial long jumper and although Zalgiris kept fighting, Brose did enough from the foul line to win. "We said at the beginning in the locker room that we need to bounce back, play as a team on offense and defense because we are playing against a very well-coached team that on both ends of the court knows exactly what they want. I believe the guys put a great team effort and what I can say is congratulations. It’s one win. I don’t think it’s anything special; it was a great win for the psychology of the team because when you are losing games getting so close, I believe that affects also the psychology of the team. So we are feeling a bit better and looking forward to our next practice tomorrow." "We kept fighting. We played some good defense. We scored the ball, finally. Usually we struggle down the end making buckets, but we got a chance and we made it happen. We are a team where everybody scores and you never know whose night it’s gonna be. Tonight it was mine."